The McCombs School of Business was founded in 1922 at the University of Texas at Austin. Earlier known as the School of Business Administration, it was merged with the Graduate School of Business in the year 2000. McCombs is accredited by the Association to Advance Collegiate Schools of Business International (AACSB) and offers students everything from undergraduate to terminal degrees. The UT Austin boasts a massive 431 acre campus centrally located in the city of Austin. McCombs School of Business also offers MBAs on other UT campuses in Dallas and Houston. There are also international offerings in Mexico City. The Austin campus is located less than 10 miles away from the Austin-Bergstrom International Airport. McCombs is located in a three-building complex at 21st and Speedway streets. This complex, called The George Kozmetsky Center for Business Education, is the heart of McCombs. The first building in this complex is the College of Business Administration Building. This building opened in 1962 and currently houses the undergraduate programs as well as the Bureau of Business Research. The second building is the rhombus-shaped Graduate School of Business Building. This is the current home of the graduate MBA programs. The third and newest building in the complex is the AT&T Executive Education and Conference Center. It was opened in 2008 and is the location of the Executive MBA program and offers many amenities to students and visiting executives. This building offers classroom space, breakout rooms, conference halls and even three restaurants and a hotel. In February 2018, McCombs officially opened a new home for their graduate programs. The building, called Robert B. Rowling Hall­–or just Rowling Hall–is 458,000 square-feet of traditional, tiered classrooms as well as a multitude of adaptive spaces for meetings, brainstorming and invention. McCombs has 126 tenure-track and 102 non-tenure track faculty members who are consistently ranked among the top 10 national faculties. They teach subjects covering six departments: accounting; finance; management; marketing; information, risk, and operations management; and business, government, and society. (IROM). Aside from their impressive educational background they also boast having real-world business expertise to bring into the classrooms. There are 12,937 total enrolled students in the University of Texas at Austin McCombs School of Business, with 6,450 Business Foundation students, 4,703 undergraduates, 1,687 students in masters programs, and 87 in doctoral programs. 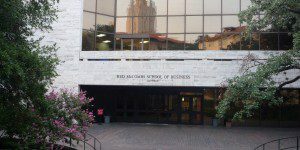 The McCombs School of Business offers five different MBA programs. There is a traditional two-year, full-time MBA degree and the Texas Executive MBA, which can be completed at the main campus in Austin. McCombs also offers a part-time Texas Evening MBA on the main campus as well as at two other University of Texas locations: Dallas-Fort Worth or Houston. Business School Degree Cheat Sheet: What Type of Degree Should You Get?